Rotten wood and mould growth. You will see before and after photos of the work done. 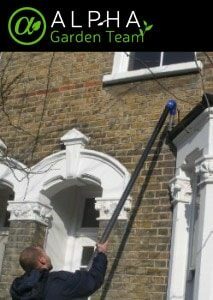 How Do We Perform The Gutter Clearing? Your home’s type (terraced, semi-detached, or detached). The approximate height of your building (in storeys) and what do you need us to do. Can we access all of your roof drainage pipes from the ground? You will then receive a price estimate over the phone. If the quote suits your pocket, the professionals will then arrive on the day of your appointment. 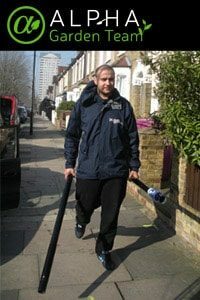 They will bring an industrial vacuum cleaner with a 12-metre long telescopic pole, that can easily reach the third storey of any property. This machine is powerful enough to deal with fallen leaves, moss growth, and even pest nests in minutes’ time. It also comes with a small camera that will allow the experts to properly inspect your gutters’ interior and spot any small cracks that may need fixing. The same camera will also be used to provide you with before and after images, so you could easily tell if the specialists have done a proper job. While you’re at it, you can take advantage of our discounts – simply order patio cleaning or gardening alongside and you will receive a neat price reduction. Please keep in mind that the technicians cannot treat downpipes below the ground, nor gutters with guards. There’s no need to expose your property or garden to unnecessary danger. Instead, fill in our request a quote form or dial 01172 420001, and leave the rest to the diligent experts! You can schedule a session for any day of the week (bank holidays included) and request free of charge quotes at any given time, so go ahead and contact our advisers today!